With summer passing way too quickly I feel the need to try to share some of the gardens that I have collected in my summer files. 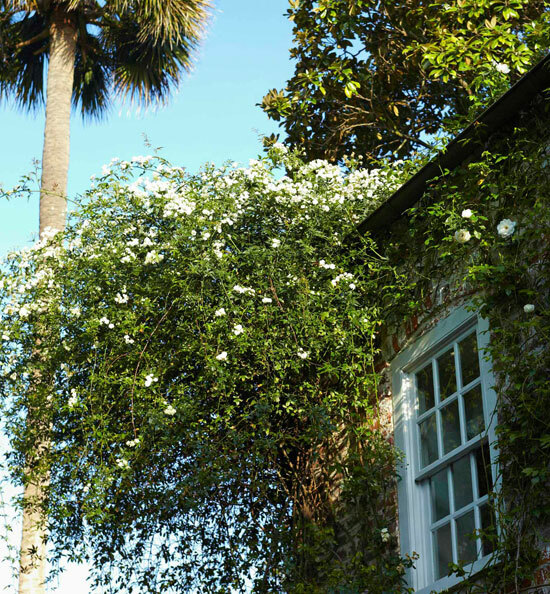 Today I chose this Old South charm in Charleston, one of the many beautiful gardens featured in Traditional Home. 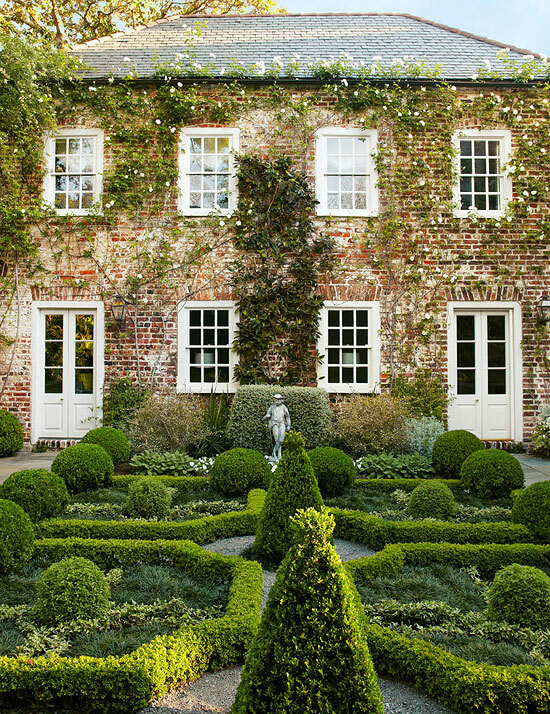 I chose the formal parterre to open the post, mainly because of the old brick house and the white climbing roses. It almost looks too good to be true! Next to the brick house is a small garden house seen in the photo below. 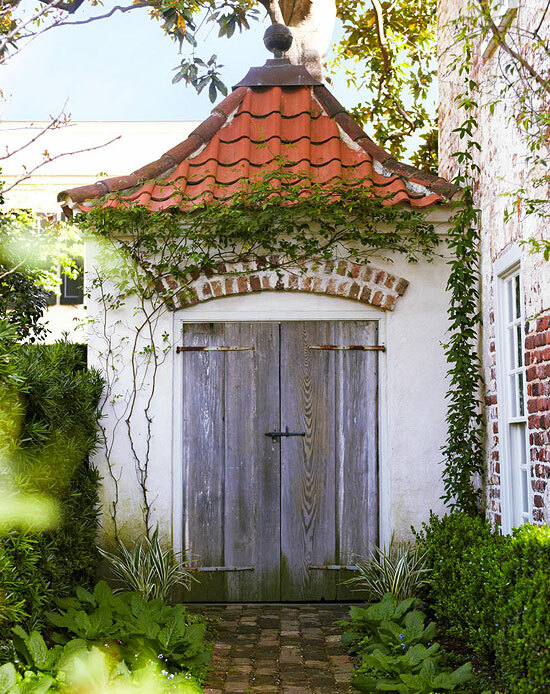 This restored house belongs to Ben and Cindy Lenhardt; it's located in Charleston’s historic district and dates back to the year 1743. Ben, now retired, was only ten years old when he planted marigold seeds for the first time and since then gardening has been his passion. In fact, he's the chairman of the national Garden Conservancy and the role of the organisation is to preserve exceptional gardens. They also arrange open days for the public to enjoy private gardens. 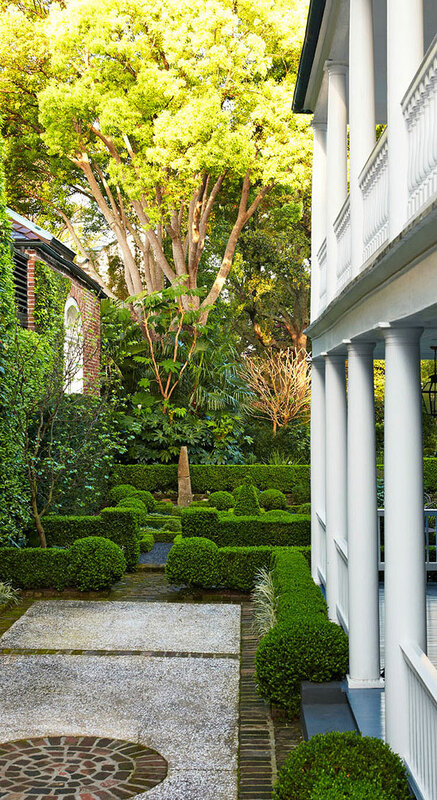 Ben’s garden design was under the influence of Loutrel Briggs, a legendary landscape architect in the Charleston area that began his career in the 1930s. His idea was to use different levels to make gardens appear bigger. It’s the most difficult art form because it changes. It takes an appreciation of balance, color, and different kinds of plant materials with strong -architectural components—all of which must be coordinated with the changing seasons to create a symphony of color, beauty, and -tranquility. 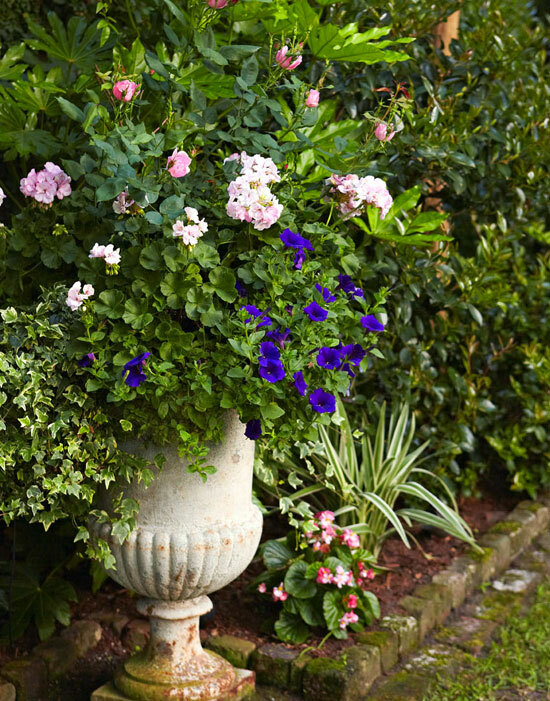 In the period “Charleston garden” there are these urns with potted petunias, geraniums, violas, and roses that add colour to the garden that mainly has white blossoms. There is also a Lutyens-style bench. 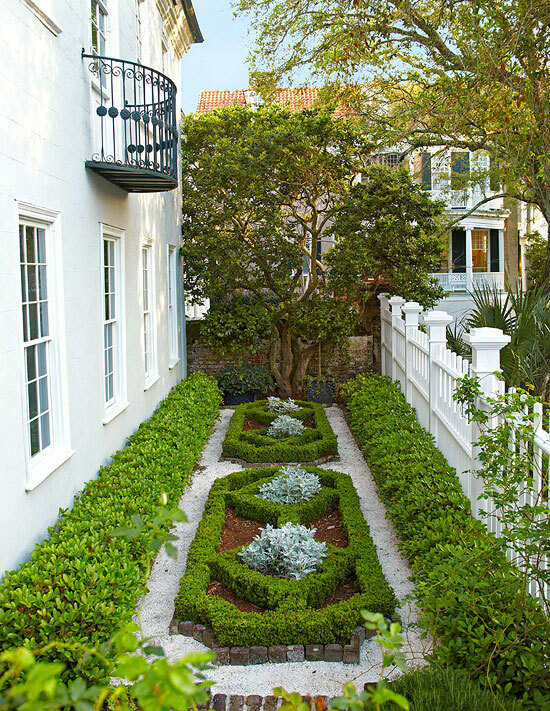 There is a colonial-style fence by the front parterre, which is planted with boxwood, ivy, and dwarf mondo grass. Do you see the old stone mooring post in the carriageway below? It was discovered during the restoration of the house. Apparently, the house had been at the edge of a creek that lead to the Cooper River and rowboats were tied to the post. I'm swooning over these photos. "It’s the most difficult art form because it changes." How every true and all the more challenging. Stunning garden, I wonder who does all of the hard work keeping it so pristine! Uf, beautiful gardens and pictures. Wellcome back, Lisa. Hope your break was wonderful. Lisa, I am so with you in appreciating this type of Southern garden. 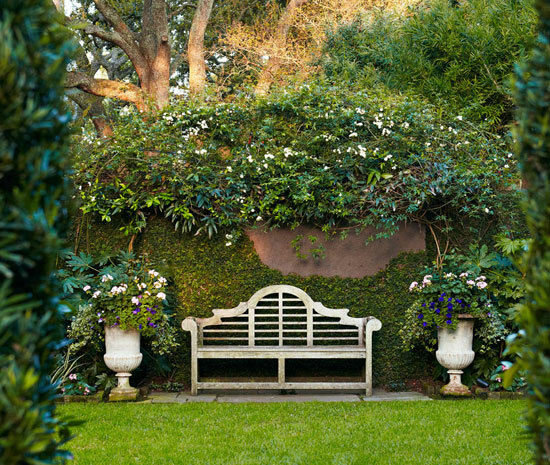 I have long been captivated with this style and spent some time in Charleston two years ago photographing the gardens. Before the trip I studied as many books on Lautrel Briggs as I could find, including one that had his original plans for many of the famous gardens in the city. I spent several days just walking the streets of the historic district, peeking over gates and down entries. I love the formal topiaries with the plantings of roses and annuals. In many ways, I think the Charleston gardens are a perfect mix of formal French design and wild, romantic English design. I'm still figuring out how to incorporate that here but studying and photographing these gardens gave me great pleasure. Your comment appears on the blog after approval. Comments with commercial links are reported as spam. © 2019 Lunch & Latte | Lisa Hjalt. Powered by Blogger.